Among the humble privileges of painter artists is to have a totally flexible schedule. Although one must work hard, its not like in the Medical Profession; there are no night guards and there is no compulsory need to carry a cell phone in case of emergencies, nor to take night calls. Artists are not bound to a strict production and sales program as are business executives, although we may admire the discipline and efficiency in other professions, in general artists enjoy a certain easiness in their ways and means. Our mental concentration is rather scattered. We depend on muses and other inspiration factors which are not always at our disposal. Although many of us do make use of high technology when convenient (mostly to communicate with clients by sending images of our work on line) in all truthfulness, we could do our work using the same materials and utensils Michael Angelo and Leonardo used -brushes and paint- hundreds of years ago. Nevertheless, as indifferent as we may want to be to time and techno, our models are ephemeral and they do change with time. When painting out of doors, we are pressed by the movement of the sun. If we do a live model, fatigue finally does away with any given pose. As for flowers, they soon wither. Photography may be of great help, yet, it will not reproduce the inspiration of the moment, nor the stereovision that we get through our two eyes, instead of the single one lens of the camera. Written notes can go a long way to complement a good sketch, where we may express sensations and feelings, together with colors and values of the light on our painting subjects. There was one memorable occasion when I attended a case comparable to a medical emergency: a night call. Some friends of mine commissioned a large format oil painting to go on their dinning room. She wanted flowers as a subject; yet, she didn’t want lilies nor roses, nor orquids as those I had painted before. She wanted poppies! …this flower of simple beauty, which has inspired a song where my friend had gotten her nickname since childhood. Obviously, this complicated the painting project a bit, since I did not really know what poppies like and their cultivation is now forbidden by law. Given my friends’ virtues of perseverance consistency, I was assured time would provide a proper model, since these flowers turn up spontaneously in the country and are often seen from the roads. This was the way the emergency call came about: one night after dinner, while I was already in my pajamas and cuddled to my family someone knocked at our door, very decisively. This seemed strange, as my neighborhood is rather silent after 9pm and few would dare make such noise on my door. I opened quickly and there they were: my friends complete family, one of their children holding a red country flower bouquet in his hands. It took me a while to understand the scene, but then they explained: “we were on our bay back from Guadalajara, and suddenly we saw the poppies! So we hurried up and cut them. Sorry to bother you at this time of the night, but they are withering very fast” now, what could I do? I said good night to my family and very much against my artistic schedule I grabbed a pencil and started to sketch. By 11pm that night I had rendered a set of decent sketches; by then , the angle in most stems had lost strength. The pistils in flowers were not stretching up to the sky anymore; now they seemed to point to the horizon. Its funny how just a few degrees can influence the way things look to us. When we are young and vigorous we walk with our shoulders up, our head high and our back straight, but as we age our backbone bends and we have to face down. I certainly did not want to express melancholy or old age in my friends’ painting, so I went on sketching and writing observations until dawn. I made notes referring to the petals and leaves, and I was observant of the subtle changes in color. Once happy with the complete description of my patients, the poppies, I went on to sleep for a while. Around ten in the morning I came down for breakfast, not without checking on the little flowers: they were no more. They seemed to be turning into mulch. 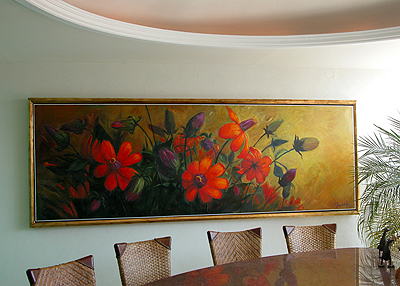 I was eager to do a good job, so I brought out a 12 feet long canvas I had already stretched for the purpose, and with my memories of the poppies still fresh I started painting, placing on canvas those ideas that had appeared in my mind the night before. Several days went by. I did not dare to throw away the flowers, thinking perhaps there was still something to learn from looking at them. I couldn´t help thinking about the drugs that are obtained from such pretty flowers, and about the people involved in the drug business, who make such enormous fortunes… then I remembered a verse from my Bible “for like the grass they will soon wither, Do not fret because of evil men or be envious of those who do wrong; like green plants they will soon die away” (Psalm 37:1-2). For my friends and myself, the poppy flowers have given us good fruit, as you may see in the photograph. I do hope you like them.